PORTABLE & COMFORTABLE: This Belt is lightweight and foldable , makes it easy to carry. Just transform it from travel sack to harness in a flash. ☻ Recommended for children ages 6 to 30 months (approx 35lb.) that are capable of sitting upright unassisted. 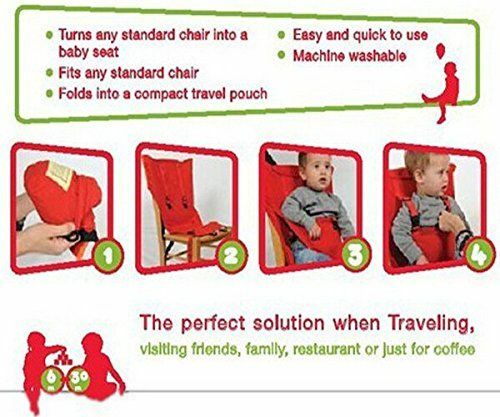 ▅ FITS ANY CHAIR - Its easily fit many chair from dining chair to car seat. Simply fold it flat and you can bring it everywhere during travel! Simply unravel from the self contained pouchand attach to any chair in seconds. Successfully received product. Fast Shipping! Product is exactly as shown in the pictures! all, it is good, but very small package. quality is good, расцветка bright, baby like.